Jakarta is not a beautiful place. Not, at least, in the conventional sense. No decent travel publication would describe this gridlocked, teeming megalopolis of 10 million people – or 28 million if you include the surrounding suburbs and smaller cities – as “picturesque”, “stunning”, or “postcard-perfect”. Unlucky commuters associate the Indonesian capital with unbearable, hours-long traffic jams; civil engineers proclaim it the fastest-sinking city on the planet; and environmentalists warn of Jakarta’s worsening air and plastic pollution. In short, it is not the kind of place most people would fly halfway around the world to see. And yet, give Jakarta enough time and it will surprise you. 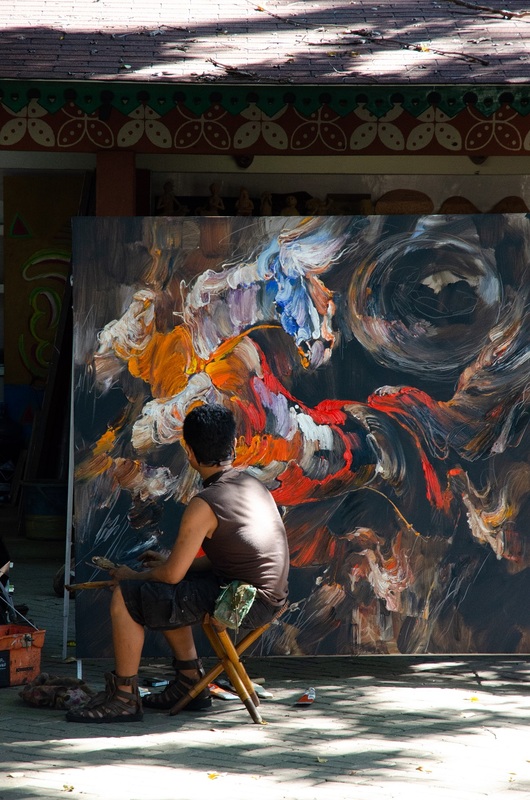 Amid the immense sprawl of concrete and chaos, you might be won over by the scent of nasi goreng being stir-fried in a wok by the roadside, a shaded neighborhood park where musicians serenade passersby with their violins and cellos, or the nostalgic restaurant serving up regional Indonesian dishes in a renovated Dutch colonial bungalow. Yes, there are indeed religious zealots in all-white Arabian clothing, and misguided teenagers flying the black flag of a banned organization that wishes to turn this astonishingly diverse nation into a caliphate, but Jakarta is also home to DWP, Southeast Asia’s largest electronic dance music festival. You will inevitably encounter young women in pastel-hued hijabs donning tight tops and jeans, and perhaps even a Muslim contact who privately tells you with a grin, “Whoever says pork isn’t delicious hasn’t tasted it before.” Unlike their easily offended counterparts in Peninsular Malaysia, hardly anyone here seems to care that malls across the capital are putting up porcine-themed decorations for the Year of the Pig. 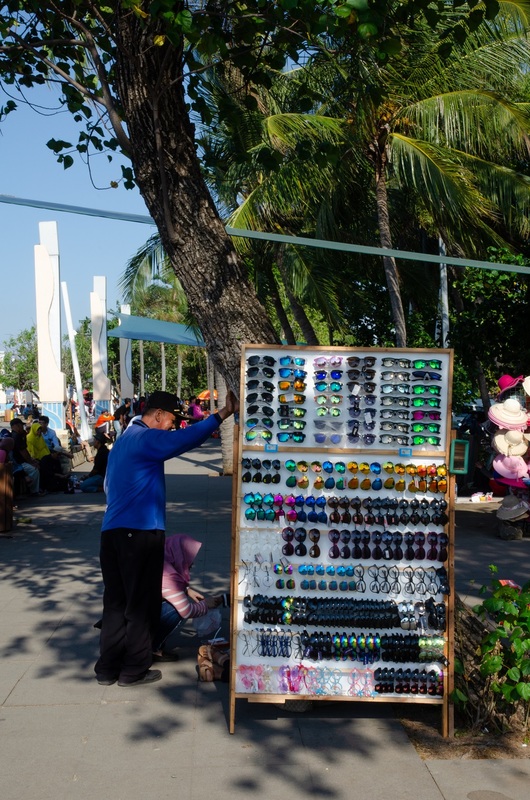 Another facet that might surprise the casual visitor is the existence of Ancol Dreamland – a rare patch of coastal real estate with a public-access promenade and boardwalk (that said, you do have to pay a fee to get in). 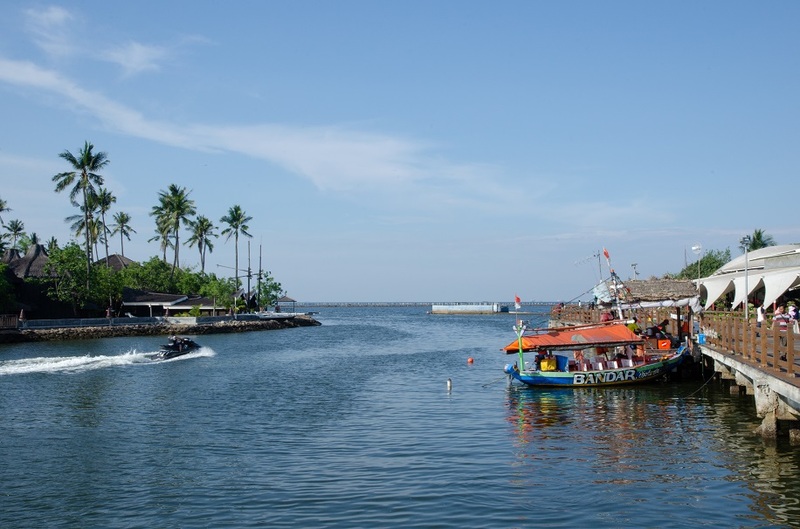 Although Jakarta was founded as a trading port, the city has largely developed with its back to the sea. Dutch-era planners are partially to blame: crisscrossed by a network of near-stagnant canals, the original 17th-century Dutch settlement at the mouth of the Ciliwung River became a fertile breeding ground for diseases like malaria, cholera, and dysentery. 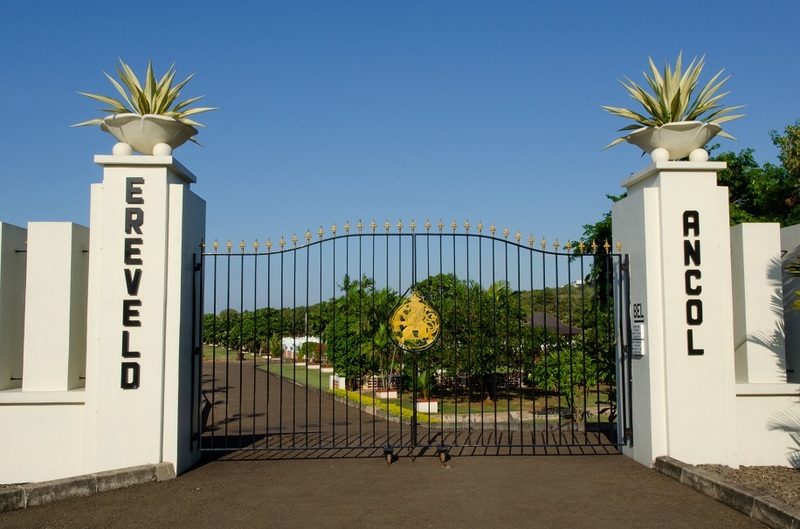 By the mid-19th century, colonial authorities had moved their base four kilometers to the south, creating a new center of government around a large open field where water buffalo once grazed (today’s Merdeka Square). 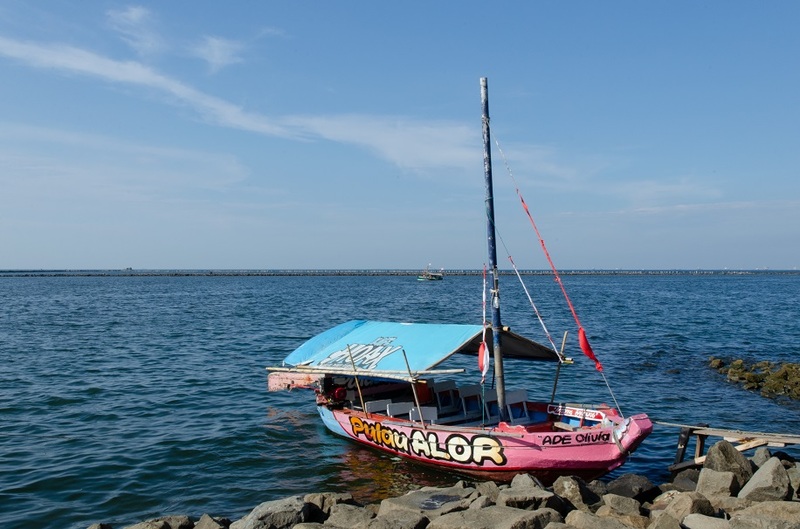 It is perhaps a reflection of my own laziness – as well as Jakarta’s notorious traffic jams – that it took me more than two years to pay Ancol a visit. A spate of recent work trips had meant seaside explorations in Thailand, the Philippines, and, right on Singapore’s doorstep, the Indonesian island of Bintan. 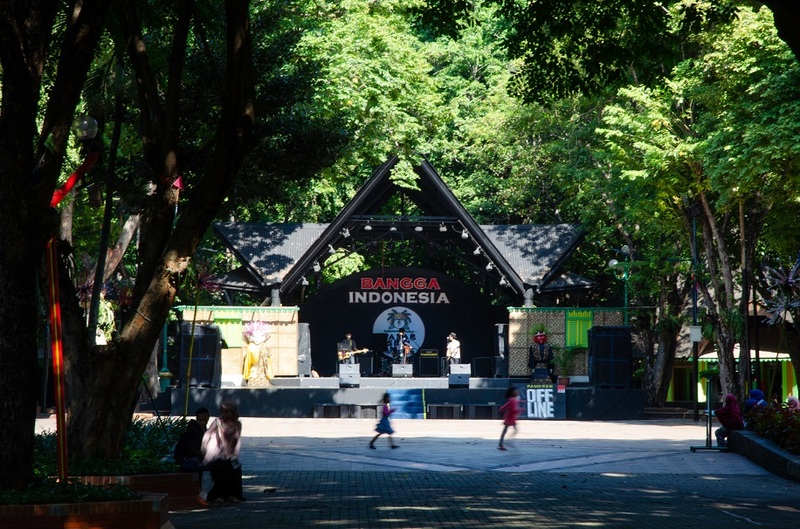 Bama’s long-simmering plans for a weekend excursion to Ancol Dreamland remained on the backburner until earlier this month. 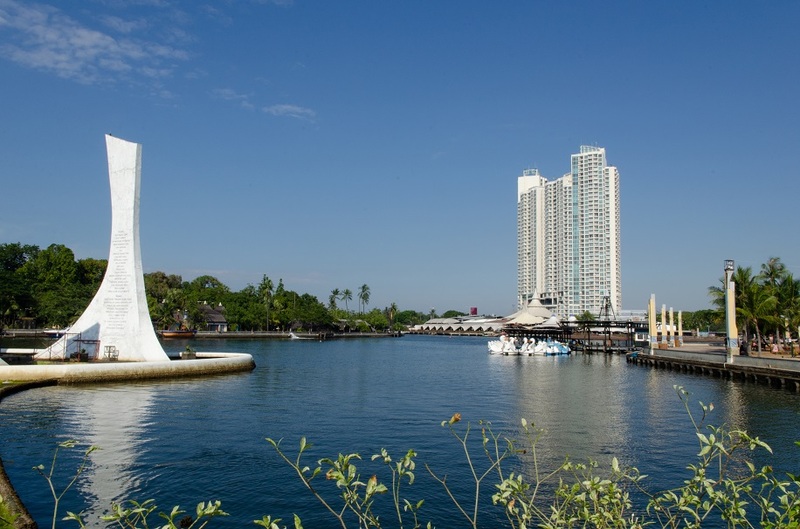 At first glance, Ancol Dreamland (Taman Impian Jaya Ancol in Indonesian) bears a slight resemblance to Sentosa in Singapore, though it hasn’t been scrubbed within an inch of its life and predates that island’s development by a decade or so. What was once a patchwork of swamp and fishponds were filled in during the 1960s to create a 552-hectare (1,364-acre) entertainment and leisure district containing several theme parks, an aquarium, a colorful artists’ village, two hotels (including one with shingled cottages beneath swaying coconut palms), as well as a bunch of seafood restaurants. Two artificial beaches have also been added, though I personally wouldn’t take a dip in the less-than-clean waters of Jakarta Bay. And for history buffs there’s even a World War II site. Who wouldn’t love a boat tour? You should; a relaxing stroll by the sea is a nice change from a trip to the usual malls and coffee shops. I just returned from my first trip to Indonesia — in fact, it was my first time in Asia. I wish I’d seen your posts before going there. I spent a few days in Jakarta, but traveled mostly elsewhere. 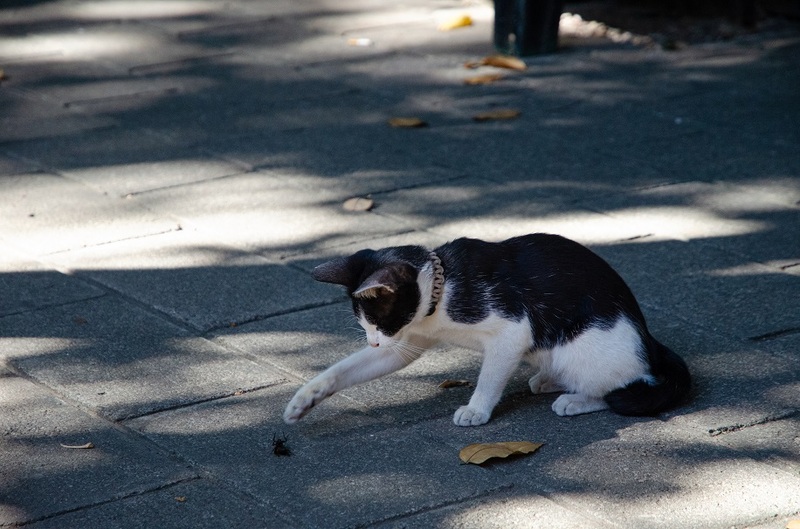 I’m working on my post now about my travels. I’ll share it with my hosts, who are in the foreign service stationed in Jakarta for another year. I think your outlook would give them a fresh view of the place. Hi Kim, it’s great to hear that you were recently in this part of the world! I’m looking forward to reading about your travels here in Indonesia – I hope you were treated well and got to see some of its loveliest parts. I must admit that Jakarta is not on my list of must see places, but I am happy to know there is beautify there as well as crowds. There are some beautiful corners if you know where to look – and they are quite often tucked out of sight from the main roads. Sometimes I really dislike predictive script. I meant beauty. 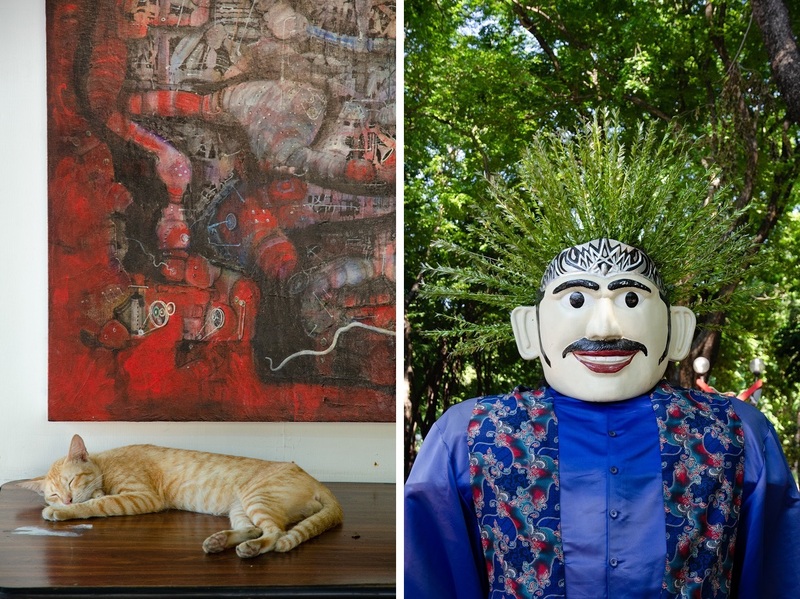 I would not have expected this at all in Jakarta, and I get why you had to go check it out. I’m afraid it does not entice me, not when I know Indonesia has so many beautiful beaches on the other islands. 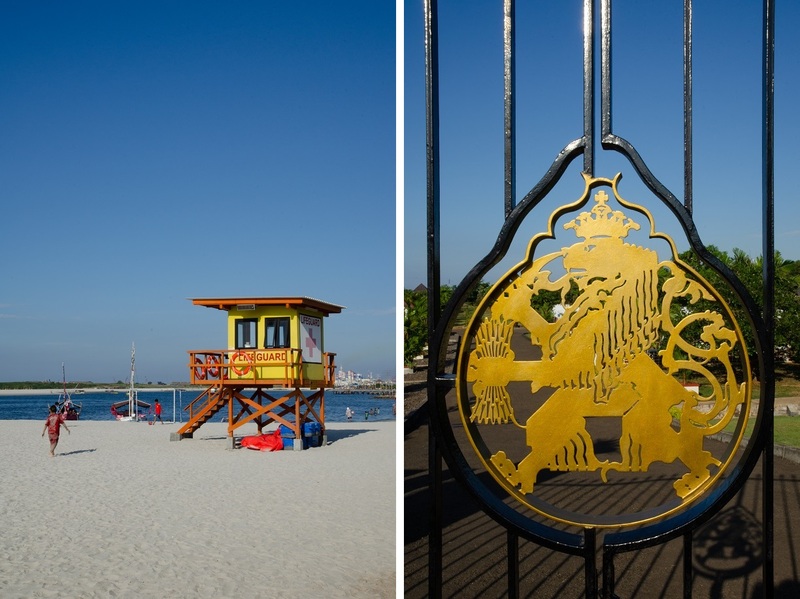 I was actually pleasantly surprised by Ancol’s artificial beaches, although as you mention they simply can’t compare to the gorgeous strands of Bali or Lombok or countless other places around Indonesia (the industrial backdrop of the nearby port area doesn’t exactly add to the charm!). The most interesting things for me though were the Art Market, the Dutch war cemetery, and just seeing how people were spending a leisurely Sunday afternoon by the sea. ‘Whoever says pork isn’t delicious hasn’t tasted it before.’ LOL. Ha, that is definitely not me in the picture – I wouldn’t be caught dead posing like that! 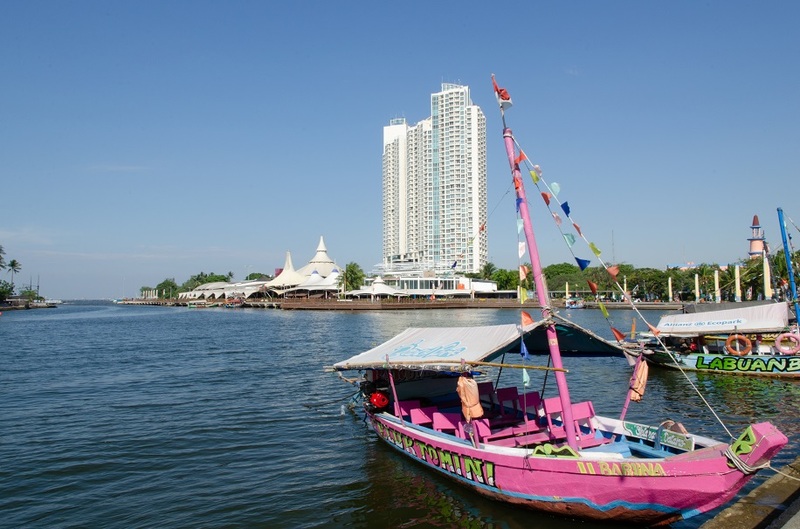 When I was a kid, Ancol was probably my favorite place in Jakarta for its theme park (which I visited a few times). Then, when I was in the final year of college, I went to its aquarium with some close friends — I returned with my parents in 2011. However, my older self appreciates Ancol’s quieter sides now, including Pasar Seni and some stretches of the beach. 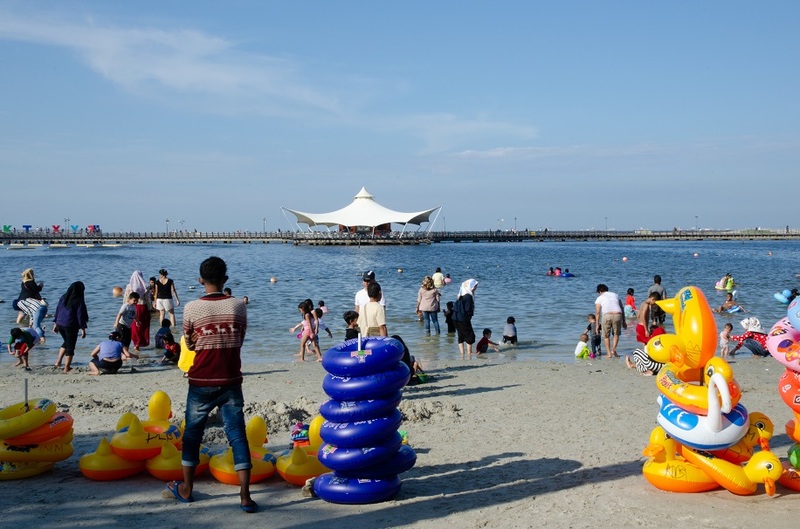 To be honest when I suggested that impromptu idea of visiting Ancol given the day’s nice weather I had a low expectation of the beaches. So I was pleasantly surprised to find them nicer than I thought, and it was just nice to feel the sea breeze. Thanks for the spontaneous idea, Bama, that was clearly an afternoon well spent! I am not usually a fan of theme parks but after hearing your stories about Dufan I wouldn’t mind experiencing it for myself. Considering the cleanliness and relatively good shape of things in Ancol (compared to other sightseeing spots in Jakarta), I guess the money earned from entrance fees is being spent wisely. I don’t mind a sprawling grid-locked ciity; I live in one after all. But so much better if it has a wonderful place like this. Wonderful photos, as always. Much appreciated. 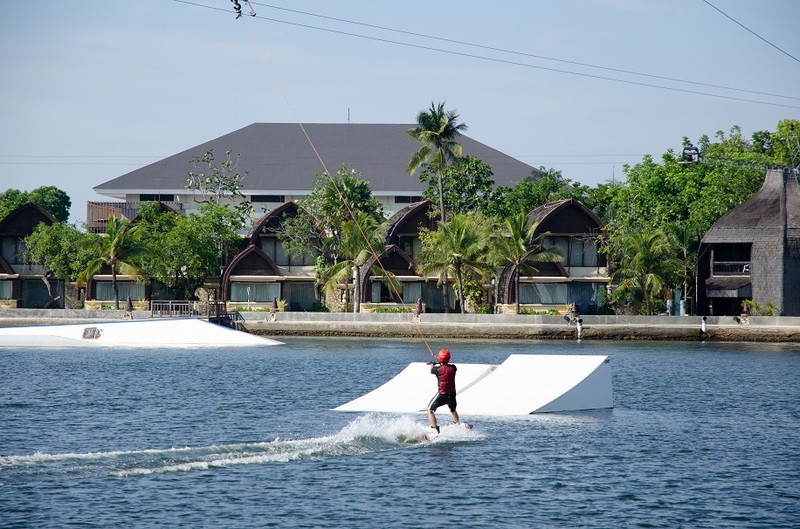 It would be great to see more coastal areas around Jakarta given over to parkland and leisure areas like this. Wow — certainly not the Jakarta I remember, though I do agree that throughout my times in Indonesia, I too found it the most relaxed Muslim country. I wonder if you will recognize Jakarta if you were to return – its skyline just keeps sprouting more glassy office towers and residential blocks, major improvements are being made in public transit (we’ll finally have our first metro line this March), and the middle class is booming. Probably not — I was last there when I travelled with my daughter who was nine at the time; now I’m guessing she’s older than you! James, I was struck by your comment “give Jakarta time and it will surprise you”. I think this is so true of many places and especially big cities that have a reputation for being chaotic. I certainly wouldn’t have expected anything like Ancol in Jakarta. Looks like a great place to spend an afternoon. Your comment about the year of the pig made me chuckle. I hadn’t thought about how the decorations might be perceived by Muslims and how different it is in Jakarta versus peninsular Malaysia. That’s a good point, Caroline. I don’t blame people for skipping Jakarta entirely on their Indonesia trips. It’s not exactly geared towards tourism and the sheer size (plus the traffic) makes it difficult to navigate. 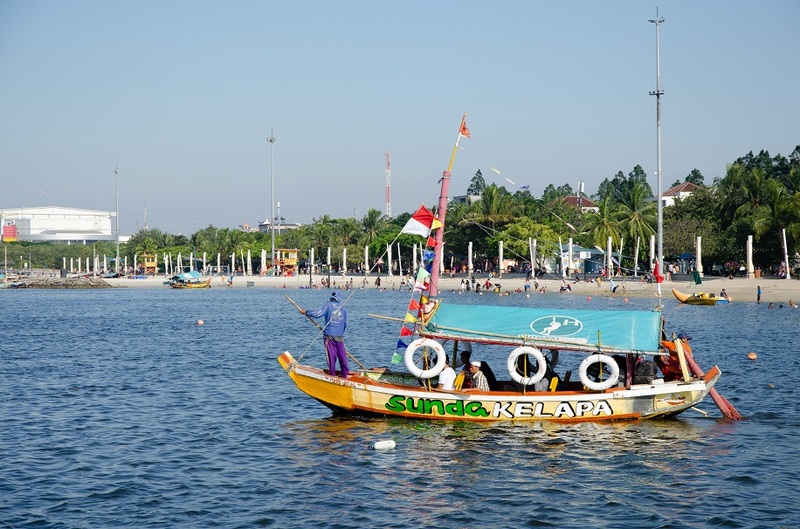 Ancol was a real eye-opener – I definitely wasn’t expecting to find people jetskiing and wading/swimming in the waters of Jakarta Bay, especially not after seeing the woeful, polluted state of the city’s rivers! 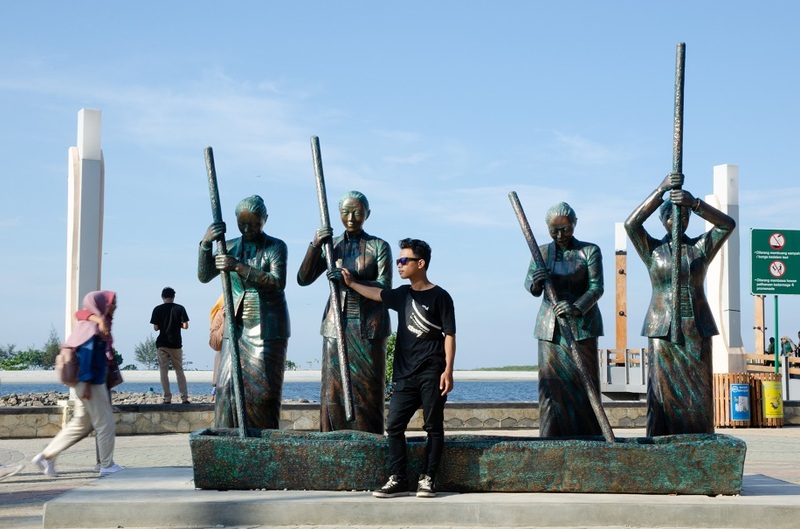 I love the promenade and the spacious pedestrian track along Ancol Beach. It is clean and modern. If it’s promoted well, it can be a destination for foreign travelers, along with the Kepulauan Seribu. Maybe. But Ancol could do with an MRT station for better access – I doubt that most overseas visitors would know how to take the commuter line from Kota or a TransJakarta bus. You are right. TransJakarta isn’t designed to be a foreign tourist friendly public transportation mode. In according to help this problem, I wrote an English post about how to use TransJakarta and the commuter train. Second, Jakarta didn’t promote its tourism well. After the launc of our MRT, I hope TransJakarta and the whole Jakarta will be more “international”. Unlike many others, I would actually like to see Jakarta! I was such a geography nut as a kid, and Jakarta was one of those memorized capitals that intrigued me because of its distance from home and strange name. I imagine it being like Kathmandu in the sense that it would be overwhelming in a not-always-positive way at the beginning, but like that city, it would grow on me as it has you. Still, having a little escape to a seabreezy shore would probably be nice! Wow Lex, it’s great to see that kind of enthusiasm for a place like Jakarta! It’s very much an assault on the senses, although Kathmandu feels much older and almost medieval by comparison (not in a bad way though). I’d love to show you around if you ever decided to do a short stopover here on the way to/from Bali and other places in Indonesia – and I’m sure Bama would feel the same! I very much hope to take you up on that someday! I admit I didn’t care for Jakarta.. Indonesian islands are definitely on my bucket list but Jakarta not so much. It might also be because of news of deadly terrorist attacks in the last few years in Jakarta. 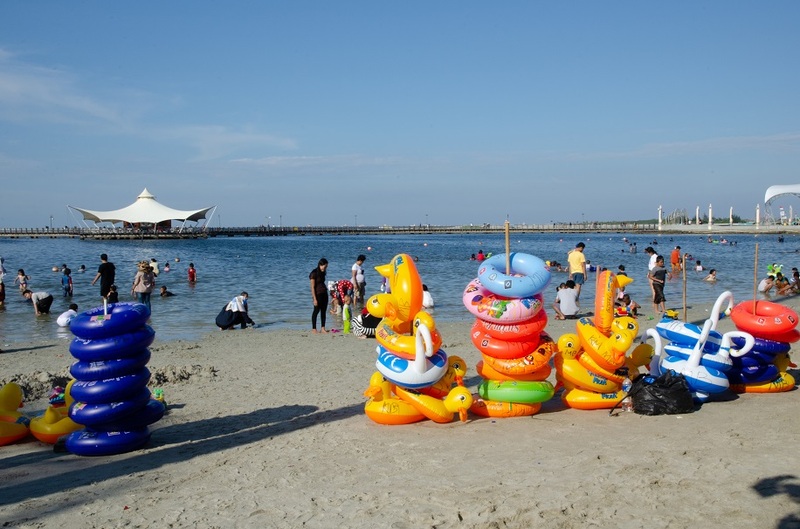 I am from Nepal and Kathmandu is a polluted, chaotic city with minimal infrastructures, so I can imagine how big of a relief it must for Jakarta residents to have places like Ancol to escape to. It does look relaxing there. You’re right about big cities having an element of surprise no matter how many times you visit! Thanks for sharing your thoughts, Pooja. I’m not surprised that you perceive Jakarta in that way given how much of the international media reports about Indonesia – but the truth is that European cities like Paris, London, and Brussels have witnessed far more terrorist attacks by comparison in the past five years. I’ve actually found Jakarta to be a lot safer than people think.